I feel like I should write something other than a review at some point. But I don't know what to write about. So whoever reads this, if there's any topic in particular (related to video games) that you want to read my thoughts on, post it in the comments or write me an email about it! Anyway, today I'm writing about Cave Story, one of the more famous indie games to come out in the past few years. Cave Story is a Metroidvania type game that originated on the PC, though it has been ported to WiiWare and is also receiving a 3DS port. The player controls a silent amnesiac who discovers an evil plot concerning the rabbit-like Mimigas, and is the only one strong enough to confront the mastermind known as "the Doctor" and his minions. Over the course of the game the player will meet other NPC's, get lots of nifty weapons, and slowly uncover the truth behind their past, the world they're exploring, and the Doctor's plans. Overall the story is well told, though some parts did feel a bit abrupt. Also, while a lot of the characters have interesting personalities, they somehow don't feel like a very prominent force in the story, even though they are. Another problem is that I felt like a meddling outsider for a large portion of the game, which was not helped by the fact that I found it very hard to differentiate between the Mimigas (who make up between half and a third of the cast). Even though the important ones all had different colors to distinguish themselves, there was an incident where I thought that one of the Mimigas at the end of the game was another one that had actually died much earlier, and was extremely confused until I finally realized who it actually was. Don't get me wrong, I enjoyed the story, it just felt oddly distant, maybe because of how quickly I played through the game. There is also one scene that is a significant exception to the sense of distance I felt from the story. Hopefully this won't spoil too much, but at one point a character dies and it actually felt significant, unlike most other character deaths in the game I actually felt sad about it. I learned later on that it's actually possible to save her (and necessary to access the bonus level at the end of the game), but a new player working without a guide and following the general video game rule of 'inspect everything' definitely won't be able to. In fact, if playing without a guide, the only indication that there's a possible alternative route is that the booster item received by playing this way is labeled as version 0.8, suggesting that there is a higher version available. 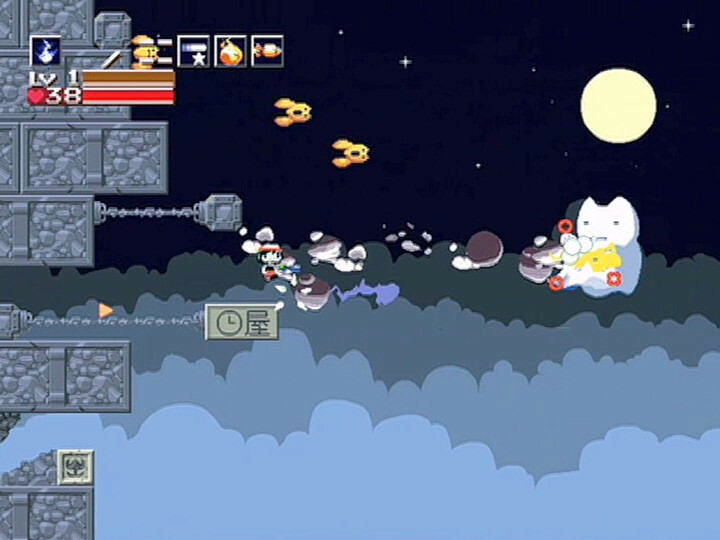 The gameplay centers on the player platforming through areas and shooting all enemies encountered. The platforming is simple enough, the player can jump reasonably high and later on receives a booster to supplement movement and an air tank to allow breathing underwater. The player receives a wide variety of weapons to fight with, each with different attributes and uses. In addition, defeated enemies can drop weapon experience, and each weapon can be upgraded from level 1 to level 3 to make it stronger offensively (aside from one weapon where leveling it up actually weakens the weapon), but weapon exp and levels can be lost if the player takes damage. Spread across the map are also numerous health upgrades (when these are collected, a tune plays that is wonderfully reminiscent of the Metroid upgrade acquisition tune), and missile capacity upgrades for the missile launcher. Boss fights are challenging, and there's quite a bit of enemy variety to keep things fresh. All in all, the game plays wonderfully. 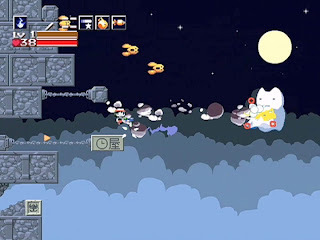 Other than that though, Cave Story is still fun to play. Honestly, if it weren't called a Metroidvania game, I wouldn't have a problem with it at all (well, I would have liked it to be easier to save that one character, but at least it's an option). All in all, I do recommend Cave Story to other players, just be warned that it is very linear despite its genre labels. Anyway, that's all I've got for now! Again, if you have a topic you want me to write about, post it in the comments or send an email! Got questions, comments, or concerns unrelated to a particular post?